I pledge to help pay for rebuild. I heard a blurb on the news that the French will be appealing for international donations. I will certainly contribute. The first Rose Window, circa 1225. One of the most copied architectural elements in the world. Just one piece of evidence of its place in history and culture. Fall of 1990 I was a young bonviant on my first trip to Paris. I landed a job as a photographer to a woman who started a Fashion / Textile Magazine, we were also lovers . Over the summer I had read Hemingway’s a “Movible Feast” and was deeply into French existentialist Simone De Bouvier and Jean Paul Sartre etc. We arrived in Paris on a mid October after spending 2 weeks in Germany, to which I hated German food and unbending strict culture. We arrived midday and we were starving, we grabbed a drink and lunch at an amazing boulangery with some family made unlabeled wine. It remained to this day my singular greater meal ever. She was wealthy enough to secure a small boutique hotel on the il San Luis, the island directly south of the Il Notre Dame. Every day I would walk the small streets with the Cathedral dominating the foreground. We of course did the tour. As a art history major and artist I was blown away, I experienced more looking at that magnificent cathedral than the aerobic tour of the Louve. Word is that some of the rose windows and other stained glass was spared. Also there was artwork saved and the organ was not destroyed. I am pleasantly shocked at hearing some of the things that might have been saved. The organ, I assumed was lost. Still skeptical about the rose window. Actually surprised the structure will be saved. So glad to hear some things have been saved. News reports say they saved Jesus's crown of thorns. There are at least twenty one places where at least parts of the crown, usually a thorn or two, are venerated. Worth consideration when we wonder about today's strange belief systems. Latest I've seen is that it may not be as bad as it looked initially. Much of the interior is not badly damaged, and only a small part of the vault collapsed. The really awful-looking photos are the wooden roof burning above the stone vault. It may be possible to repair it. One firefighter seriously injured. No other injuries or loss of life! And it is becoming apparent that much more has been saved than we originally thought. They can and will rebuild it. The French are really good at historic reconstruction. This is the cathedral at St-Malo after the D-Day battles in 1944 that destroyed the town. It took them until 1972, but you can't tell it was ever damaged. This is it now. The news is more an more encouraging. Notre Dame was heavily edited in the 19th century, partially to repair damage from the Revolution but also to modernize it a bit. A lot of the iconic gargoyles and chimera are not original - they are 19th century. So is the spire where the fire started. I was talking about this with my art historian daughter who spent four years in Paris: even if they wanted to, it could not practically be restored to how it looked in the 12th century. Notre Dame is a somewhat living fabric, with many alterations over time. Perhaps moreso than other gothic cathedrals. This is was a true tragedy. But I think I’ll see it rebuilt in my lifetime, and I hope the rebuild is well thought-out and balances historical truths. But for today, je me tiens avec Paris encore. If it took the French from 1945 to 1972 to rebuild St Malo in an economy which is growing, and infused with lots of cash, imagine how hard it's going to be to rebuilt Notre Dame in this economy. You will not see it, Cris. Sorry. If it took the French from 1945 to 1972 to rebuild St Malo in an economy which is growing, and infused with lots of cash, imagine how hard it's going to be to rebuilt Notre Dame in this economy. You will not see it, Cris. Sorry. Eh? The French GDP per capita is over 10X what it was in 1970, much less 1945 when the war ended. (data here) They have VASTLY more resources for rebuilding than they did when they fixed St Malo. It may take a while, and none of us are getting any younger, but it will be rebuilt. Last edited by Keith Wilson; 04-15-2019 at 10:15 PM. I don't think this level of pessimism is warranted. A lot of people all over the world want to see this cathedral rebuilt. Eh? The French GDP per capita is 10X what it was in 1970, much less 1945 when the war ended. (data here) They have VASTLY more resources for rebuilding than they did when they fixed St Malo. It may take a while, and none of us are getting any younger, but it will be rebuilt. Rebuilding sometimes is directly related to will and desire. This place means a lot to the French people, culture and economy. I am in tears. Truly. Earlier I read that the statues that had been in the church had been removed the week before due to renovation work. I am in tears. It took Europe 30+ years to recover from WW2. The UK had food rationing in place until 1954. It will be rebuilt quickly, we have flying tankers now. I read somewhere that there are enough fragments of the cross to build several of them. This morning, hope is back. "Only" the roofs have been dammaged. Confirmed that stained glasses and the organ are ok. Most of the art pieces saved by the firemen. And funds are already promised by many wealthy people. Hundreds millions. A national subscription is organised. It will be a long process. Probably more than a decade to rebuild. No doubt Notre Dame will recover her glory. Last edited by Rapelapente; 04-16-2019 at 02:36 AM. I was once a young man. Chateau d'Eau. My favorite Metro stop – Chateau d'Eau. I never got off there. Didn't need to. Didn't want to. No reason to taint my fantasy. I lived in my own personal chateau d'eau. I had attended classes at the Université d'Aix-Marseille-Nice in Aix-en-Provence, but it was summer and I was living in Paris. My room was in an ancient Hôtel de Ville just across from the Luxembourg Gardens. The Boul' Mich' was only a short walk away. The Hôtel was a student dormitory during the school year, but a hostel for itinerant students during the summer. The room was easily 20 feet by 30 feet with a 16 foot ceiling. I lived on a raised loft at the back of the room. This was summer in Paris – it was hot. The windows (always open) faced an interior courtyard. Frequently the afternoon quiet would be punctuated by the splash of a long pour of water onto the cobblestones down below. On other afternoons, the music of Stan Getz playing Bossa Nova would waft through the windows. I never knew the sources of these sounds. Didn't feel the need to know. This was the chateau d'eau. Like it was yesterday I remember walking on the Field of Mars one Sunday afternoon. The graveled park was only sparsely populated – it would be decades yet before we had to stand in line for two hours to buy tickets to ascend the tower. A few families were enjoying the afternoon, a few couples – lovers – and a few individuals such as myself wandered beneath the Eiffel Tower. I looked up over my left shoulder to see the base of one of the legs. An enormous structure soaring up over my head – and this was just the bottom of one of the four legs. The scale of the thing...ordinary reality could not contain such a structure. There on the Field of Mars the Eiffel Tower ruptured the fabric of reality. As the Eiffel Tower transcends space, the Cathedral of Nôtre Dame transcends time. Climb the broad steps, and enter the dark. It takes a few moments for the eyes to adjust. It takes more than a lifetime to absorb the essence, the beauty that is Nôtre Dame. Even after venturing deep into the Nave, Our Lady of Paris seems distant, existing only in another time. Last edited by webishop14; 04-16-2019 at 02:39 AM. They should have the best possible sprinkler systems in these old buildings. After part of Windsor castle burned down, the water was found to have caused 5 times as much damage as the fire did to surviving timber, plaster and stonework. It's a delicate balance when these things go up in flames. They can work by zones and act immediately. Time for skilled foreigner carpenters to learn French. For sure there won't be enough in France for this challenge. Last edited by Rapelapente; 04-16-2019 at 06:29 AM. I believe it could happen. Dartagnans already has ~50K euro in the fund they've started (of which 100% will go to the rebuilding). Agricultural production didn't recover for decades. Lots of farmers, my grandfather was one, back home paid off complete land loans off of one wheat crop in 1948. IIRC, all of Europe was still a net importer of food until 1980. Back on subject, I really do not see how sprinkler systems can save wooden roofs. Maybe France will pull it's collective head out and rally around the rebuild. The building is ultimately restorable, just like the cathedrals lost in the world wars. The art inside is the greater tragedy, and the archived documents. Skilled craftsmen will be needed from all over, not construction workers, but the best of the best, for the rest of their careers likely. I would love to be a part of that job. Two French millionaires have started already, pledged 300 million euros. 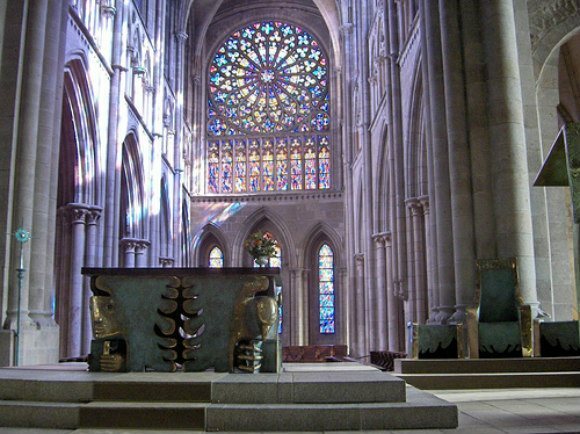 Can we talk about why it is that Notre Dame, and other great Cathedrals like it, affect us so powerfully? The renovations being done to the roof/spire when the fire started was almost 7 million dollars. To rebuild the entire roof and repair the stone vaults will be an a huge number. But, I'm sure it will be done. The time frame will no doubt be tightly linked to how fast the donations come in. Inspection of the structure and clean-up will be first, followed by a lot of historical research to get things right. Repairs will take decades. The earthquake (2011) damage to the National Cathedral in Washington, D.C is still on-going. Someone on the Wooden Boat FB page posted pictures of the interior roof structure prior to the fire. Wonderful 800 year old joinery. Simple for me, it is the architecture first, then the arts that are housed. I have no interest whatsoever in the religion. But then, I’m an architect. Sure. But these buildings were designed exactly to prompt a sense of awe, with the intent of helping people transcend themselves. We just walked down to see. Very crowded scene on the Left Bank which has the best view. A very old woman with a Walker was in tears, a young policeman came up and put his arm around her. Very touching scene. News report says the roof was zinc sheeting soldered with lead. The hot lead may have had something to do with the fire.